If you’re great at faceoffs, but are constantly hemmed in your own zone because you can’t get the puck out reliably, do the faceoff wins really matter? Bill James famously quipped that the alternative to good stats isn’t no stats, it’s bad stats. And that take certainly applies to hockey. While there are still people bashing newer concepts like Corsi and PDO, it’s usually those same people trotting out plus-minus and faceoffs as something more meaningful. Plus-minus has thankfully been getting used less and less over the years, but it seems like the folks mentioning faceoffs are only getting louder. Faceoffs aren’t necessarily a bad stat, but the amount they’re referenced is borderline absurd. It’s at the point where it’s almost impossible to get through a hockey broadcast lately without being berated by faceoff stats (or entire segments devoted to faceoffs). It’s pretty clear why they’re often cited too, and that’s because they’re the beginning of most plays and they’re easy to analyze. Every faceoff has a clear outcome and because it’s where most plays begin, our mind assigns importance to it. People tend to remember the start and end of things, but the middle gets lost in the mix. In hockey, that’s where the most meaningful things happen and because they’re more difficult to recall, faceoffs are used as a crutch. The way most broadcasts talk about faceoffs, you’d think it’s the most vital aspect to winning hockey games, when in reality it’s much farther down the totem pole. Don’t get me wrong, faceoffs have value, but they’re just a means to an end, a small one at that. If you’re great at faceoffs, but are constantly hemmed in your own zone because you can’t get the puck out reliably, do the faceoff wins really matter? Take Jarret Stoll for example. The 33-year-old was claimed off waivers on Monday by the Minnesota Wild, much to the confusion of the analytics community. But the claim was lauded by many hockey pundits because Stoll is a guy with experience that can win faceoffs. And they’re right about that. He was on a Kings team that won two Stanley Cups and is tied for seventh in faceoff percentage with Paul Stastny at 57.9 percent among players who’ve taken 100 or more faceoffs this year. He’s also been a 55 percent guy for most of his career. The problem is that Stoll has been one of the league’s worst possession players this season. With Stoll on the ice the Rangers get just 40 percent of the shot attempts which is 9.5 percent worse than when he’s on the bench. That’s the 11th worst mark in the league among players who’ve played 20 or more games. That number was minus-6 percent last season and he’s been below average since 2012-13. Stoll has also been notoriously bad at taking penalties, while not drawing many for himself. So let’s put those stats into perspective. War On Ice recently created a hockey version of wins above replacement with the main goal being converting important events that lead to wins into the same currency: goals. It’s not perfect, but their ability to put different skill-sets into the same context is statistically sound and paints a decent picture of a player’s contributions. Here’s Stoll’s faceoff ability versus his shot rate ability and penalty differential. (Unfortunately there’s no 2015-16 stats at this time, but Stoll’s faceoff ability is similar with a lower volume of faceoffs, while his shot rate and penalty differential numbers are worse). 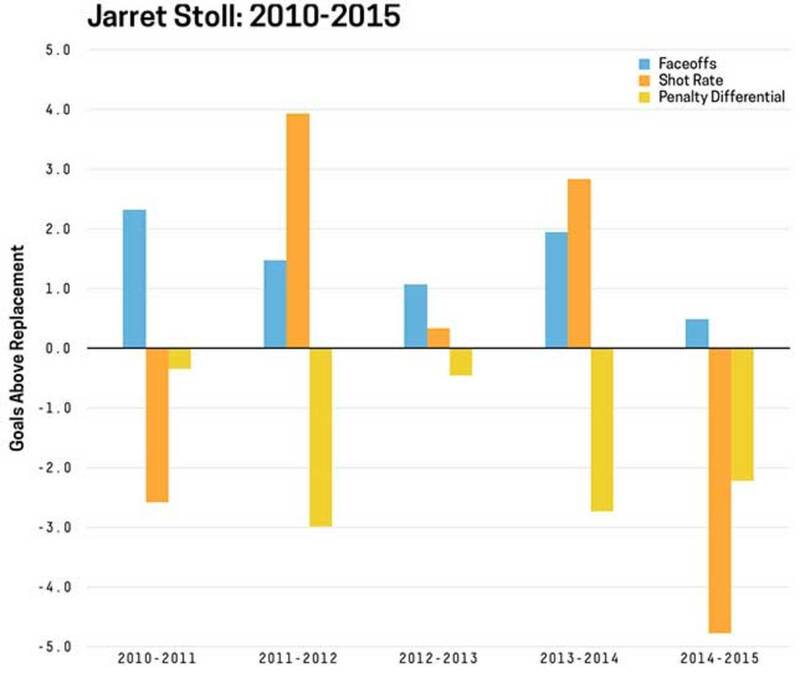 What’s evident here is that Stoll used to be an effective player, but experienced a dramatic decline last season. His faceoff ability is consistently worth one or two goals, but his value depends more on what happens after the draw. Last season was his worst in that regard and that trend has only continued this season. Unsurprisingly, being a terrible player territorially who lacks discipline completely mitigates any faceoff prowess that Stoll still possesses. And that’s because each net faceoff win is worth much less than staying out of the box or winning the shot attempt battle. Even the best faceoff guys in the league will only add roughly three or four goals from winning draws, but that’s roughly six times less than what the best possession players can add. So Stoll may be good at faceoffs, but who cares? The point of winning faceoffs is to get control of the puck and if your team is getting out-possessed despite all those wins, it kind of points to how important those faceoff wins really are towards that goal. Stoll is a detriment to whatever team he plays for because he simply can’t do much else outside the circle. And yet, that’s the stat that was cited most frequently after his waiver claim, and it was likely the reason for the claim too. Stats guys talk about shot rates because it does a fair job at predicting future goals – better than anything else that’s currently available. Faceoffs don’t. All they tell you is who won the faceoff. They have their place, but they’re just not as important as they’re made out to be.